Living a Fit and Full Life: Get Beautiful this Valentine's Day with AMOREPACIFIC! 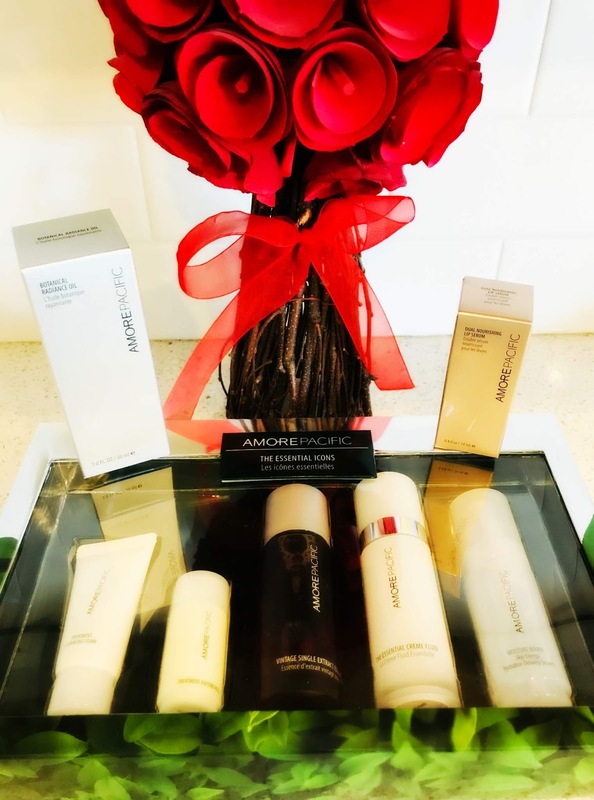 Get Beautiful this Valentine's Day with AMOREPACIFIC! AMOREPACIFIC is pursuing ethical product development, environment protection, and social contribution to become ‘The most respected global company in Asia’ by 2015. According to the worldwide Dow Jones Sustainability Index (DJSI) for 2011-12, AMOREPACIFIC has become the first in its industry sector to be listed for two straight years on the DJSI World, DJSI Asia/Pacific, and DJSI Korea. In addition, it was named the World Leader and Korea’s Best Company in the Personal Products segment for two consecutive years. The ultimate skincare regimen collection from AMOREPACIFIC, formulated with highly concentrated superfoods to reveal glowing skin every day. The perfect regimen formulated with Asian botanical ingredients for antioxidant nourishment. TREATMENT CLEANSING FOAM: This foaming cream cleanser removes impurities and makeup without stripping the skin of vital moisture, while helping to treat and prevent breakouts. Olive oil, sunflower seed oil, and mango seed butter cleanse the skin thoroughly without drying it out, while natural sugars hydrate and soften. Micro-encapsulated vitamin E beads deliver a burst of antioxidant protection, leaving complexion clean and refreshed. A gentle water-activated exfoliator, formulated with natural papaya enzymes. Eliminates dry, dulling surface cells responsible for irregularities in texture and tone and aides in the absorption of skincare products that follow. This skin enhancing essence is sourced from single extract, antioxidant-rich green tea which has been naturally fermented and aged to pre-tox and purify skin, before aging occurs. Experience the light-weight texture of a fluid, with the long-lasting benefits of a rich crème. Antioxidant-rich baby green tea leaves are cultivated and handpicked from AMOREPACIFIC's own green tea gardens on Jeju Island off the South coast of Korea. Both hydrating and balancing, this oil-free spray is formulated with pure, stabilized bamboo sap to prehydrate and prime skin after cleansing- or, spritz on throughout the day over make-up for a quick refresh. This light-weight textured oil, delivers intensely on radiance and antioxidant protection. Formulated with precious ingredients sourced from Jeju Island off the South Coast of Korea, blending Spring flower seed oil and three elements of the green tea plant. The dual-layered lip serum formulated with a mix of oil and water instantly nourishes dry lips and keeps them smooth and supple for a long time. Botanical ingredients such as fermented vintage green tea and green tea seed oil revitalize the look of dull, dry lips, making them appear fuller. The unique applicator resembling the shape of a green tea flower is designed to fit the shape of the lips, allowing the serum to glide across its contours and curves. 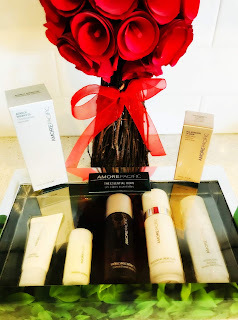 Get beautiful this Valentine's Day with AMOREPACIFIC! 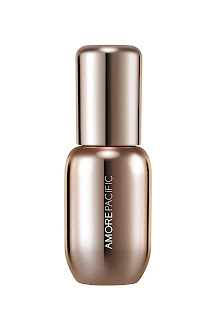 AMOREPACIFIC has quickly become one of my favorite brands, and for good reason. Their products work wonders and my skin seems to love everything I try from them. I had the pleasure of trying the products above and I'm super impressed. This Valentine's Day prep your lips and skin with AMOREPACIFIC and look you best! AMOREPACIFIC's The Essential Icons Set is the perfect set! This set includes AMOREPACIFIC's Treatment Cleansing foam which does an amazing job to cleanse skin without stripping it. This set also includes their Treatment Enzyme Peel which is one of my favorites. It's a gentle water-activated exfoliator, formulated with natural papaya enzymes to help slough off dry dead skin cells to reveal a healthy glow you'll absolutely love. Another great one in this set is their Vintage Single Extract Essence which helps to purify the skin to keep it looking it's best. You then have The Essential Creme Fluid that has definitely become an essential in my beauty routine. It leaves my skin feeling and looking restored after every use. Lastly this set also comes with their amazing Moisture Bound Skin Energy Hydration Delivery System which is a spray formulated with pure, stabilized bamboo sap to prehydrate and prime skin after cleansing. You can also use it to spritz on throughout the day over make-up for a quick refresh. Great for those of use with dry skin like myself! Botanical Radiance Oil from AMOREPACIFIC is definitely working some magic on my skin because I've already gotten quite a few compliments from friends and family who see me often. They've noticed that my skin looks healthier and I love how silky smooth my skin feels since beginning to use this product. I also love that it helps my makeup look flawless. On no makeup days this stuff gives me a healthy glow that leaves me confident all day! 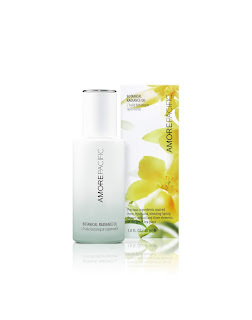 AMOREPACIFIC's Amazing Botanical Radiance Oil is the perfect way to take back your skin's radiance! Dual Nourishing Lip Serum from AMOREPACIFIC is a dual-layered lip serum formulated with a mix of oil and water that instantly nourishes dry lips and keeps them smooth and supple. I've suffered from dry lips for quite a long time and have found very few products that truly seem to help keep them hydrated and healthy. AMOREPACIFIC's Dual Nourishing Lip Serum does wonders for my lips and is definitely a keeper! AMOREPACIFIC has just what you need to get beautiful this Valentine's Day! Click HERE to find a store near you that sells AMOREPACIFIC! Click HERE to learn more about AMOREPACIFIC! Follow AMOREPACIFIC on social media!